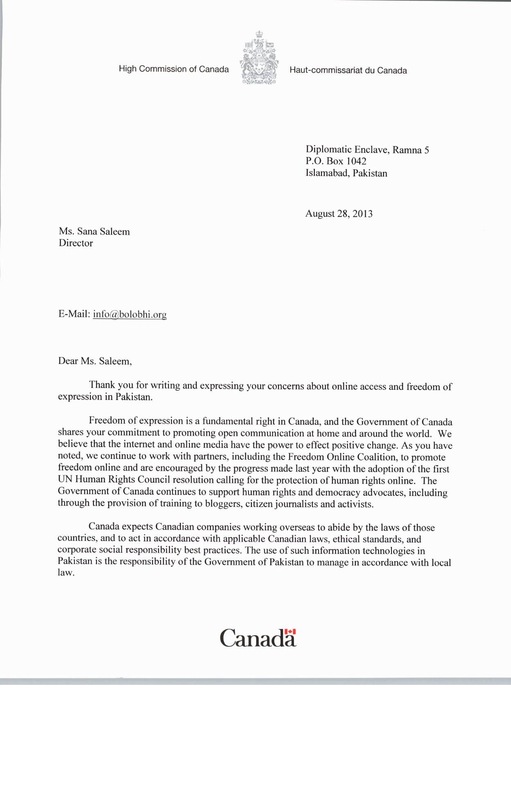 Thurday, 5 Sept, 2013: Government of Canada responded to our letter, sent on the 23rd of July 2013, which raised the issue of Netsweeper, a Canadian company, that sells technology for content filtration on the internet (allegedly to the Pakistan government). 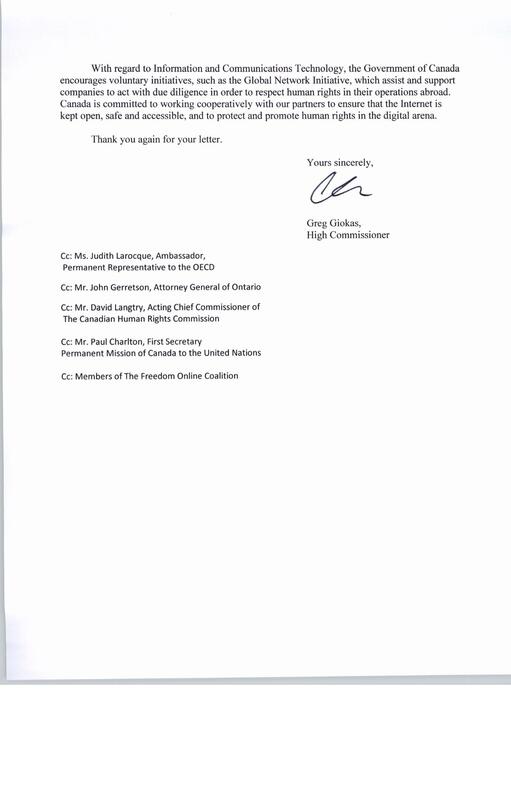 Our letter urged the Canadian Government to fulfill their commitments, to stand by the Canadian Constitution, Canada’s Global Commitment to Internet freedom & assist us in seeking answers from Netsweeper. The response from the Canadian Government doesn’t provide details on measures it could undertake to seek answers from Netsweeper. In our response we have further requested the Canadian Government to assist us in seeking information on Netsweeper’s presence in Pakistan. Given Canada’s deep commitment to human rights and freedom of expression we hope that the Canadian government would be able to strengthen our resolve to seek answers from Netsweeper to enable us to respond better to the human rights implications involved in the trade. Pasted below is our correspondence with the Canadian High Commission, for the initial letter please scroll to. We would like to re-affirm: The sale of technology tools by foreign companies to governments who use them to suppress free expression is of huge concern. While we understand that the government of Pakistan must be held accountable by its citizens, we also feel companies outside Pakistan who sell such tools to government knowing full well that they are likely to be used to curb expression needs to be held to account too. Especially since they are required to abide by certain laws and practices which may be redundant in the countries they choose to deal with. Thank you for your response to our letter and reaffirming Government of Canada’s commitment to hold Canadian companies responsible for respecting and abiding by Canadian Laws, International ethical standards and United Nations Guiding Principles for Business & Human Rights. As has been raised earlier, the sale of technology tools by foreign companies to governments who use them to suppress free expression is of huge concern. While we understand that the government of Pakistan must be held accountable by its citizens, we also feel companies outside Pakistan who sell such tools to government knowing full well that they are likely to be used to curb expression need to be held to account too. Especially since they are required to abide by certain laws and practices which may be redundant in countries they choose to deal with. We have been actively engaged in urging for access to information and the need to abide by constitutional rights with lawmakers, members of the parliament, businesses and civil society within Pakistan. This is a multi-tiered approach of working with policy makers at home and abroad to make information accessible to citizens and promote freedom of expression and access to information within Pakistan. Access to information is integral to our work and our mutual commitment to human rights at home and abroad. Access to information guarantees greater disclosure and transparency. The right to redress, to seek due diligence and to urge states in making businesses ensure their responsibility to respect human rights are all mandated under the United Nations Guiding Principles for Business & Human Rights. We therefore would like to request you in assisting us in seeking information on Netsweeper’s presence in Pakistan. Given Canada’s deep commitment to human rights and freedom of expression we hope that the Canadian government would be able to strengthen our resolve to seek answers from Netsweeper to enable us to respond better to the human rights implications involved in the trade. We believe in the effectiveness of initiatives such as the Global Network Initiative, Electronic Frontier Foundation’s “Know Your Customer” guidelines and the Freedom Online Coalition and strongly believe in States’ commitment to protect and promote civil liberties, freedom of expression and democratic rights at home and abroad are instrumental in changing the ways in which the internet is being governed today. We hope that the Government of Canada will continue to fulfil its commitment and assist us in the light of the United Nation’s Principles For Human Rights & Businesses by providing access to information that will allow us to fight for constitutional rights at home. 7 Responses to "Canadian Government Responds To Netsweeper’s Presence In Pakistan"